The Rat is one of the earliest distortion pedals, arriving on the market in 1978. Prior to that, there were only a few gain pedals: the Colorsound Power Boost, the Maestro Fuzz-Tone FZ-1, the Sola Sound Tone Bender, the Dallas Arbiter Fuzz Face, the Dallas Rangemaster, and the Electro- Harmonix Big Muff. Much like we saw a burst of fuzz pedal releases in the late ’60s, we saw a burst of distortion pedals in the late ’70s. The years 1978-79 presented us with the Boss DS-1, the MXR Distortion +, and the Proco Rat. This accompanied the punk, metal, and hard rock revolutions at that time. 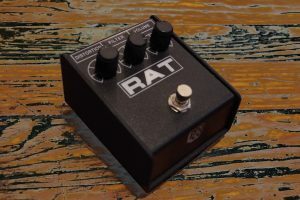 Where overdrive pedals like the yet-to-be-released Boss OD-1 and Ibanez Tube Screamer use soft clipping to create their saturation, the Rat uses hard clipping. This not only results in more gain, but also a grittier sound. Where fuzz can get lost in a live mix and sometimes sound flabby, the Rat cuts like a warm knife through butter. Fuzz pedals tend to be mushy. If you play a chord through a fuzz pedal, you’ll sometimes hear a blur. Whereas the Rat somehow keeps the distinction of each note in the chord. It’s like every note in the chord has its own distortion and doesn’t interfere with the others. So while it can be very saturated, it’s clean at the same time. There are very few distortions that achieve this in the same way the Rat circuit does. I’ve been thinking about the Rat. Things come into and go out of style. Nowadays there are so many pedal options, it’s easy to get distracted or want to try the newest pedal. I’ve been researching classic guitar tones, and as you might expect my exploration led me to the Rat. Whether you realize it or not, you’ve heard it too. There is nothing flashy about the Rat. It looks simple and leaves no uncertainty about its intention. It’s understated in the best way. Although in theory the Rat was competing with the Boss DS-1 released the same year, the only tonal similarity is in the fact they’re both distortion pedals. The DS-1 has a very different tonal palate. The sound of a lot of metal is not that of an amp being pushed to its limits. That’s more the sound of rock from the ’60s and ’70s. Speaker breakup and tube sag aren’t usually the preference for metal guitarists, who like a tighter response. If we think of James Hetfield’s tone on “Kill Em’ All,” it’s not the sound of a Plexi on 10. His tone is tighter than that. He was in fact using a Marshall Plexi, but with a Rat. The Rat plays quite well with British amps. Dave Grohl used the Rat with a Vox AC30 on the first Foo Fighters record. The tone knob on the Rat always surprises me. It has be one of the most dramatic pedal EQs ever created. With a subtle twist of the knob, you can really transform the pedal. It really seems like the pedal’s character morphs. Its tone knob is really a low pass filter. As you turn the knob, you’re either allowing more treble through or cutting it out. I don’t use the tone knob just to boost or cut treble, though. 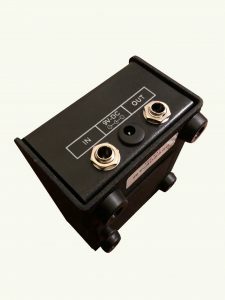 If it’s the base of my tone, I sometimes consider pulling back on the treble from my amp so I can boost it on the pedal. This seems to change the harmonic response of the pedal. The weak spot of the Rat to me is in its cleaner distortion sounds. I often think Tube Screamer circuits’ weak point is with the gain all the way up. Neither weakness is by any means a deal breaker for either pedal, and is very much down to personal taste. I don’t use a Rat to get subtle tube amp soft clipping. I use the Rat to get some nasty, clear saturated tones. But others feel very differently. Plenty of players have used the Rat as their light overdrive pedal and adore it. It’s not that it’s bad at overdrive. It’s that it excels so much at distortion. I find most pedals have a sweet spot for my playing. Everyone’s playing is different. I’m much more likely to cascade drive pedals rather than turn one up all the way. I rarely need to cascade any more drive when using the Rat. I can’t imagine needing more. There is enough gain on it to make classic metal heads give a middle-aged devil horns hand gesture. Pro Co has made some improvements with its newest version of the Rat. Whereas I tend to be a purist when it comes to classic sounds, the new features are welcome. They added an LED under the letter A in Rat so you can see if the pedal is on. Not having a LED isn’t a deal breaker with a pedal. I’ve gotten used to playing vintage fuzz pedals that don’t have LEDs. It’s fine, I just have to remember what I’m doing. But it sure is nice when it’s there. Pro Co also added a standard 9v power jack. Older models used a 3mm pin jack. These older-style MXR power jacks are kinda annoying. With the new barrel jack, it’s easy to swap the Rat in and out of my pedalboard. The Rat also accepts a battery. But honestly, I hardly use batteries anymore. The only time I do is with germanium-based fuzz pedals. Otherwise, I use Strymon power supplies. Less pollution and waste. The Rat is also an affordable pedal. You can find them for $69. That’s quite a steal in today’s world. Especially for something that doesn’t sound inexpensive. I do wish they were still made in the USA. I get it, manufacturing has changed. And there is no way they could make this in America and keep the same price point. But still I like to see products made in the USA. As far as I can tell, they didn’t skimp on any components. Quality control seems high. The Rat is built like a tank. A couple of songs I reference to describe the tone of the Rat are Nirvana’s “In Bloom” and Blur’s “Song 2” (the bass guitar is playing through a Rat). But if you dig deeper, you’ll find a lot more examples. It’s not only one of the originators of distortion, but it’s been manufactured since its inception. As a resident of NYC, it’s the only kind of Rat I like to see at a venue. Let’s listen to some examples recorded with a Les Paul with Florence Pickups and 50’s wiring and a Vox AC15 pushing out about 96dB in the room. Recorded with a UAD Apollo and AEA Ribbon mic.